The Angel is holding up a 1 x 1 1/2" frame for you to place a photo of your beloved. The text on the lower portion of the urn is always engraved on the urn. The text reads: Forever Loved, Forever Dear, Walking With Angels, Forever Near. 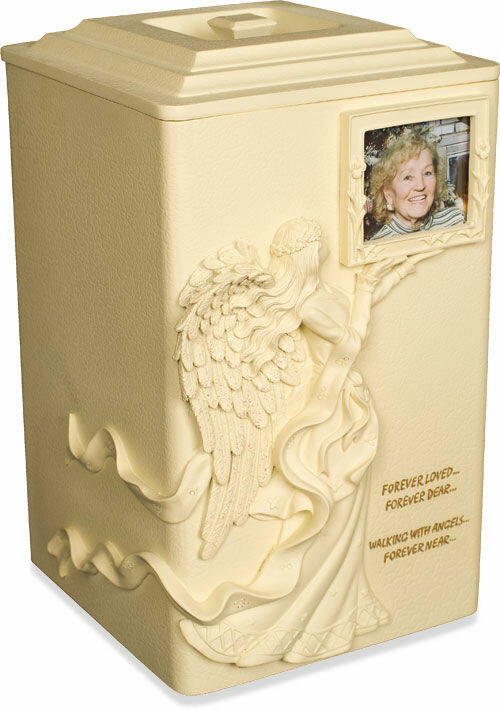 The urn is a beautiful cream ivory with a light mist of fairy dust on the wings. Color of urn may vary slightly to that shown in the photos. Crafted from high quality cold cast polystone (a combination of crushed stone and resin), this beautiful urn has a similar look and feel to carved stone with the same intricate details. The lid can be sealed with any household epoxy such as Gorilla Glue or Krazy Glue. Just put a few drops on the top of the urn before placing the lid on the urn. Please click on the Detailed Images tab for more views of this urn. Please limit engraving to no more than 20 spaces for the name and no more than 30 spaces for the dates and the endearment. Months will probably have to be abbreviated in order to meet the required space limit, or dates can be engraved in numerals. Please check your engraving information for capitalization, punctuation, and correct dates. You will not receive an engraving proof. Please allow 1-3 business days for engraving prior to shipping, even for expedited orders. Capacity: Holds approximately 245 cubic inches which is adequate for most people with healthy weights less than 240 pounds. 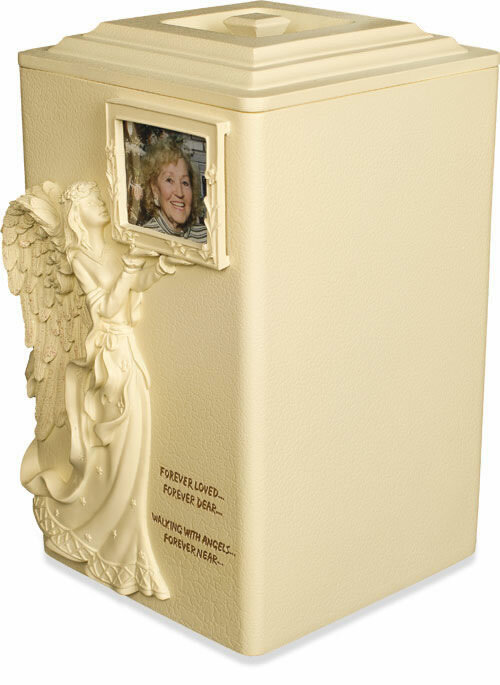 Non-engraved urns usually ship same business day if the order is placed by 1pm Eastern Time. Ships from the West Coast.